London mayor Boris Johnson and two-time Oscar winner Kevin Spacey have called for continued investment in cultural attractions during the downturn. Arts & Business, which creates commercial links to the arts, said investment had fallen 7% since 2008. 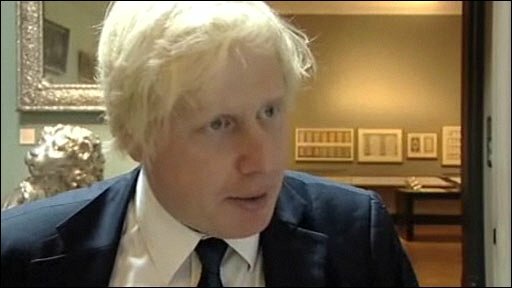 Mr Johnson says theatres and museums are not a luxury and contribute greatly to London's economy. Mr Spacey, artistic director at the Old Vic theatre, said without help, some arts institutions will not survive. Both men are to give keynote speeches during an event at the V&A museum on Monday evening, which will address the issue of funding for the arts in London. Arts & Business said 42% of businesses have reduced investment in the arts in the last three months. It also raises concerns that such funding might not pick up again until 2011 - or even later - which would have serious implications for the sector in the long term, and the economy as a whole, it is claimed. Tourism is worth £16bn to London's economy, the majority of visitors saying arts and culture are why they visit London. 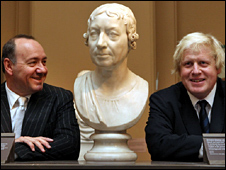 Mr Johnson said: "Arts and culture are not a luxury, they are part of this city's DNA, its unique selling point. "It is why people want to live and work here and seven out of 10 tourists say it is a reason for their visit. "At a time of recession it is more important than ever to invest in the arts." Mr Spacey added: "Having lived here for seven years I genuinely believe that the UK's pre-eminence in arts and culture constitutes one of the nation's most powerful natural resources. "But many arts institutions are suffering, and without political will and both corporate and public support some will struggle to survive. "It's time for us all to step up and ensure that our vibrant and diverse cultural life is protected." Simon Robey, head of Morgan Stanley UK, said: "The arts in London are both the mirror of a thriving city and a central part of what makes London such an important, vibrant and diverse place to work and live. "Business forgets that at its peril."